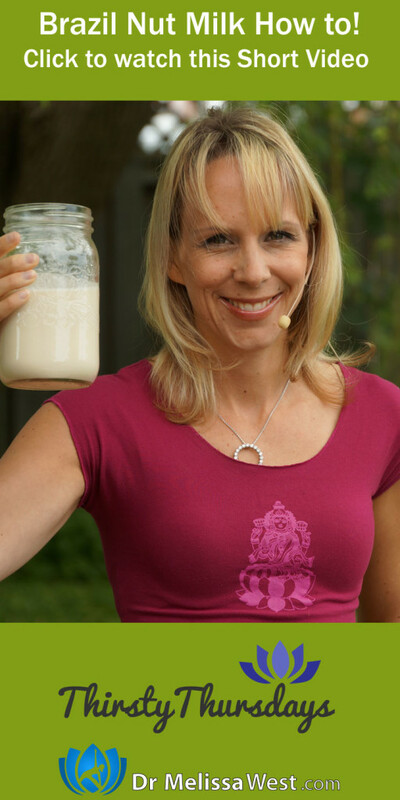 Last week I promised you I would show you how to make Brazil nut milk. When we talked about how to have glowing skin and we discovered one of the only plant sources of selenium were brazil nuts. As we learned last week, Selenium prevents and protects your skin from sun damage. Brazil nuts are the most highly concentrated source of selenium. In fact, scientists have shown that a daily Brazil nut is a better source of the mineral than taking a supplement. Brazil nuts come from the Amazon forest and provide us with much needed protein, fats and many other essential nutrients. Brazil nuts will lower your LDL’s – those are the bad cholesterol. They are a great source of vitamin E. They are also a good source of the B complex vitamins including thiamin, riboflavin, niacin, B6 and folates. Brazil nuts also contain trace minerals including copper, magnesium, manganese, potassium, calcium, iron, phosphorus and zinc. Today I am going to show you just how easy it is to make brazil nut milk in your Hurom Juicer or any other slow press upright juicer. Directions – combine all the above ingredients in a bowl and ladle through your juicer. Then strain the nut milk to remove any excess pulp.